China Bullion: The People's Bank of China 2009 Panda Silver Brilliant Uncirculated legal tender coins. The People's Bank of China 2009 Panda Silver Brilliant Uncirculated legal tender coins. Every year excitement and buzz builds surrounding the design of the new Panda coin, and this year has been no exception. 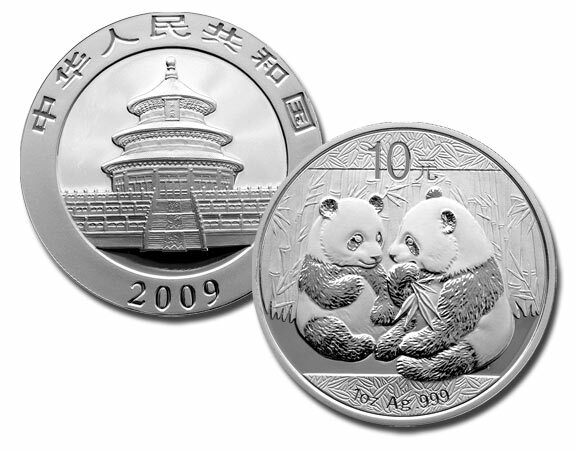 The beautiful designs of the 2009 Panda Silver coins have made the wait worthwhile. These coins are 99.9% pure silver - and are now available to collectors who are assembling date sets, and to silver bullion buyers who expect a continuation of the current desire for silver in the market.